IT COMES and goes every year, but when the Sushi King’s Chinese New Year Yee Sang is available, loyal customers keep coming back to savour the dish. The Malaysian-Japanese food chain’s Yee Sang promotion is something that many customers look forward to because it only costs RM38.88 for a large serving (serves four) and RM8.88 for a mini version. What’s even better is that the restaurant has managed to retain the price since its first Yee Sang promotion in 2001. Last year, the restaurant sold 5,000 large sets and 20,000 mini sets. Sushi King general manager Law Hwee Ching said the seafood Yee Sang, which was part of the chain’s annual Hotate and Yee Sang promotion, was a big hit among its customers as it was affordable, and included fresh and good ingredients. “Every year, we have people asking for it even when the promotion is over due to its popularity,” she said. The Yee Sang is a combination of shredded cucumber, radish and carrot, combined with seafood such as salmon, crab sticks and scallops. Tossed in plum sauce, the dish is a great appetiser. Sweet and sour, it’s a refreshing meal on its own without burning hole in your pocket. 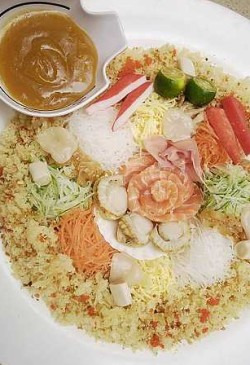 “We don’t use the colourful crackers that you find in ordinary Yee Sang as we use the Tempura batter for the crackers. So you’d find it very crunchy and juicy with the other fresh ingredients, while the sauce just adds more flavour to it,” she said. The Hotate or the scallop is also a special part of the promotion. 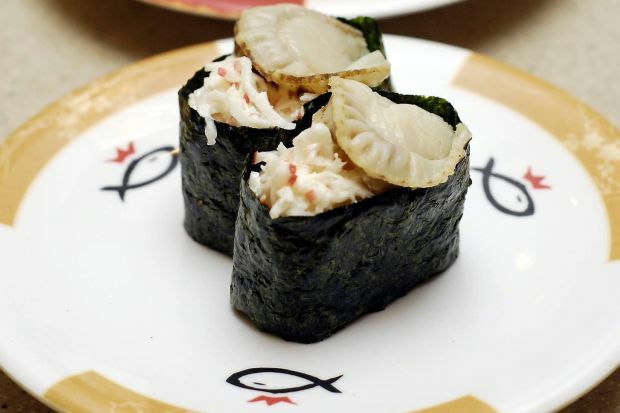 There are a few Sushi’s to choose from, and there are also some hot meals using scallops. There are 15 dishes in total, and some of the interesting and popular ones are the Hotate Chinmi Roll (seasoned scallops, cucumber and shushi rice wrapped with crepe), Hotate Gunkan (scallops, shredded crabstick with mayonnaise and sushi rice), and the Hotate Terriyaki (scallops cooked with Terriyaki sauce). Some of the hot dishes are Hotate Tama Don, which is steamed rice served with scallops, egg, onions and green soybeans, and the Hotate Tamago Toji Soba, which is Japanese buckwheat noodles with scallops, egg, onions and spring onions. If you fancy fried dishes, the Hotate Isobe Age, which is deep-fried scallops, eggplants and french beans with seaweed flake, would be good choice. With purchase above RM80, you can also get a pack of ang pow packets for free. The promotion is valid from now till Feb 28 at all Sushi King restaurants nationwide.